Anyone who is reading this, loves walking into a beautiful yarn shop or walking into a knitting show such as Stitches Market. On the scale of one to ten, you’re feeling an emotional eighteen when you are near all that yarn. Your senses become deliciously bombarded with an array of beautifully displayed yarn. The interesting smells of a conglomeration of wools, silks, mohairs and angoras freshly bathed in dye and vinegar fill your brain. Your eyes search and enjoy the blending and clashing of the rainbow of colors. Your hands rise to experience the irresistible textures of fuzzy, shiny, hairy, bumpy, and matte as you continue this primal hunt. Around the bend you peruse a book department and find yourself mesmerized by all the sweaters you will one day have the time to make. Forward to the next mental image: You stuffing that bag of yarn, along with that great idea in the article, in a closet with all of the rest of them! That’s if you put it away. It might even be difficult to get that closet door closed. Very few yarn or fabric consumers, buy something, use it, and get more. We collect the stuff. Ask a room full of knitters where they keep their yarn and you’ll get an amazing concoction of creative so-called storage explanations… along with a few giggles and guilt. Oh yeah… lots of guilt. “I keep my yarn in those plastic flat tubs that slide under the bed”. In bags, baskets, tubs, behind closet doors, we all have our yarn collection. And that’s perfectly normal. There’s nothing wrong with you at all. As a matter of fact, I always loved the description from understanding husband of a friend, Irene, the owner of Cotton Clouds Yarn Company. He identified the collection of yarn as “sophisticated nesting material.” We all are just making a good home, get-tin’ ready, squirreling our nuts, preparing for the cold…. for that one Sunday when the yarn shop is closed and we won’t have something to do! So here’s the point: Ok, so you have all this yarn. Good – the more the better. Now let’s display it. Why not put your yarn on display just like that yarn shop. Don’t squirrel it away in those plastic bags, tubs and baskets. Pick a place in your home: an extra bedroom, the basement, the corner of your family room or den, or anywhere art would be. Then, show what you have for all to see – especially you. Just like towels professionally displayed in department stores, put the reds together, then the oranges next to the reds…then get the orangey yellows and the yellow greens… greens to the turquoises to the blues. 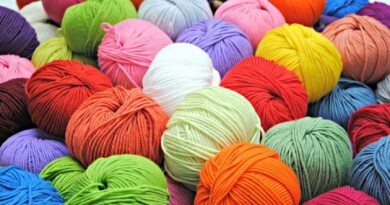 Look at a color wheel found in many yarn shops or art supply stores. In our knitting books, many authors include a color chapter with a color wheel. Let this color wheel act as your guide and keep the colors displayed in that order. Keep the soft muted baby colors, the sage greens, the mauves, the postman blue, and whites and grays on the lower part of the shelving unit and the dark, close to black colors at the top. Keep the brighter colors in the center. It doesn’t have to be perfect. Arrange this exciting display of your yarn collection in any way as long as it follows a color wheel’s arrangement. You’ll find your display very effective and visually stimulating to anyone. Keep lights with lights and darks with darks. Stand back and look at your artistic creation. If anything jumps out, it is probably in the wrong place. Place it somewhere else so that it blends in with the others in that section. When you buy new yarn, you’ll know right where it goes. Get a nice floor lamp and shine the light on your textural rainbow and enjoy it. 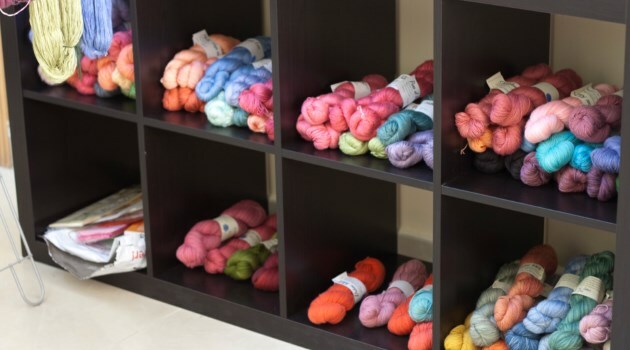 When your yarn at home is an exciting display, it can create the same feeling as when you visit your local yarn shop. Don’t be surprised if you find yourself filling in colors for your display — not your next sweater. You’ll soon begin to use this old and new yarn collection in your knitting much more than if it is in bags and plastic bins hidden away and forgotten. 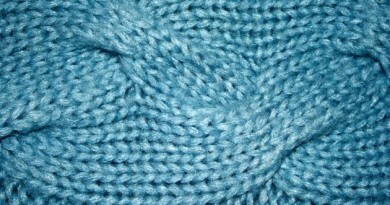 Now that you have a plan for all that yarn, needles are another source of anxiety, especially when you are buying a sweater’s worth of yarn, it’s closing time, and you aren’t sure if you have the correct size needles at home. While it is not necessary to display them, it’s nice when you know what needles you already own. Circulars in a box are like a wiry snake pit and the sizes and lengths are long forgotten. Straights have the same problem, can get broken, and can become “unpaired” from lack of attention and order because there is no single place for these items to be stored. Double points grouped and purchased in fives inevitably wind up in groups of 2 or 3 and rendered unusable. Take some responsibility for that as well. Find some way to organize and take the guessing out of your life. I do like those needle organizers. I have used those organizers, which allow me to see what I do and do not have in my needle stock. Knowing I have every size is a good feeling because when I go home to make a gauge, I can change my needle size to the more appropriate one to get a particular gauge or fabric. If you organize your needles, when you go to the store, you will know what you need. Don’t forget what is on the needle already, as many of us have more than one project going in the works. I love my knitting library and I’m proud to show it. 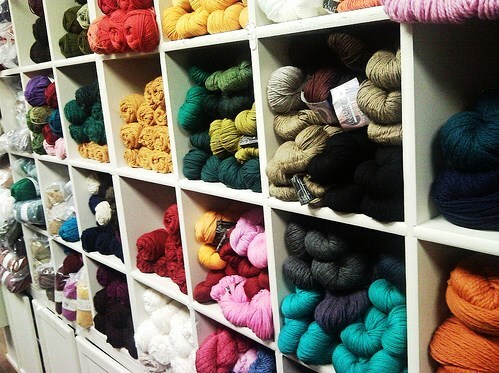 If you have your yarn in a dedicated “craft” room, it’s nice to have your library here, too. I have a dedicated shelf for my knitting books, technique videos, and magazines that get grouped into loose leafs. Every now and then, when I need an idea or want to understand or choose a technique. I go to my comforting knitting library and search. Those out of print publications become extremely precious. Tools for finishing like blocking boards and Blockers, a steamer, a collection of crochet hooks and sewing needles, stitch markers and holders, and other accessories should be part of your collection. Keep a large drawing pad or notebook to make notes of your success and failures. If you record your experiments, you will know if it was a great idea and how you accomplished it. You could have also made a not-so-great decision. By referring to your notebook, you’ll be able to avoid that mistake for the future. Finally, if you have the wall space, a corkboard can hold pictures of all your dream sweaters. A good light over a comfortable chair or sofa, an I-Pod full of music you grew up with, and a few minutes or better…. a few hours a day knitting in front of your beautifully lighted yarn collection, surely completes this little piece of high ground, your oasis, your personal heaven. There are some nice ideas here in this article. May be I will use some at home. Don’t forget to share how you did.